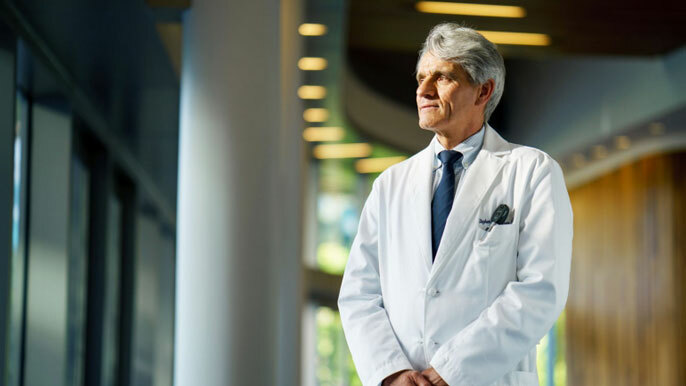 Stephen Hauser, M.D., was instrumental in the research that led to the new multiple sclerosis drug that targets B cells in the body. A newly approved drug that is the first to reflect the current scientific understanding of multiple sclerosis (MS) — is holding new hope for the hundreds of thousands Americans living with the disease. It also highlights the importance of clinician-scientists like UC San Francisco’s Stephen Hauser, M.D., who are working to transform research into cures for patients. The drug, the first that targets B cells in the human body, grew out of the work of Hauser, chair of neurology at UCSF, whose team persevered for decades in elucidating the science behind MS, defending findings that contradicted long-standing assumptions and translating the science into a therapy. In MS, the immune system attacks the protective myelin covering around nerve cells, stripping them like insulation from electrical wires. We now know, thanks in large part to Hauser and his colleagues, that immune cells known as B cells lead the attack, mistaking myelin protein for harmful agents. The attacks cause inflammation that disrupts the communication between nerve cells. The first episode of MS typically strikes in early adulthood and the disease advances over the years to devastating disability. Depending on where the inflammation occurs — the brain, spinal cord or optic nerves — patients can develop muscle weakness, incoordination, bladder difficulties, visual impairment and cognitive problems. An MRI scan of a person with multiple sclerosis shows bright spots, which are MS plaques. In relapsing-remitting MS, the most common form, people experience intermittent flares of symptoms followed by periods of complete or partial recovery. About one in 10 people with MS have the more intractable primary progressive form and experience steady worsening of symptoms without remission. There are no cures for MS, and existing treatments only partially reduce symptoms of relapsing-remitting MS. No therapies at all have been effective for primary progressive MS — until now. The approval of the ocrelizumab comes after studies that have shown remarkable results for both forms of the disease. In December 2016, the New England Journal of Medicine published the spectacular results from a pair of major international clinical trials led by Hauser, confirming that ocrelizumab can block the inflammation that drives the disease. The trials, known as OPERA I and OPERA II, compared the effectiveness and safety of ocrelizumab to that of interferon beta-1a, the current standard treatment for relapsing-remitting MS. Ocrelizumab cut annual relapse rates by 47 percent, reduced disability by 43 percent and shrank inflammatory lesions in the brain by 95 percent compared to interferon. A separate clinical trial, known as ORATORIO, found that ocrelizumab could modestly slow the advance of primary progressive MS, which until now has been resistant to treatment. These Phase III trials have shown that ocrelizumab, an antibody that targets the CD20 molecule on the surface of B cells, is extremely effective for relapsing-remitting MS, which is caused by B cells circulating in the blood and bound for the nervous system where they orchestrate inflammation. These B cells — about 2 percent of the B cells in the body — are destroyed reliably and for several months with each dose of ocrelizumab treatment, which is given by infusion every six months. The trials were sponsored by F. Hoffman-La Roche (Roche), the company that holds the patent on ocrelizumab. Researchers believe that primary progressive MS is caused by the other 98 percent of our B cells that live in protected areas within brain tissue. Ocrelizumab is only modestly effective at targeting these hidden B cells. But it is nonetheless the first therapy to have any effect on primary progressive MS.
Approval of ocrelizumab could mean a new outlook for patients such as Sarah Warto, one of Hauser’s patients. Sarah Warto, right, one of Stephen Hauser’s patients, was diagnosed with multiple sclerosis as a college student. Her worst flare-up was two years ago after giving birth to her daughter. Diagnosed with relapsing-remitting MS as a college student more than a decade ago, Warto has experienced several bouts of disease symptoms that have ranged from impaired depth perception to difficulty walking. Her most recent flare-up occurred after she’d given birth to her daughter two years ago. “I had a fairly severe attack that really limited my ability to use my leg. I could walk for a minute, and then after a minute it was like a totally different person had taken over my body,” she said. With ocrelizumab on the horizon, she dreams of a future free of relapses, especially as she thinks of having a second child. The approval of ocrelizumab marks a shift in the treatment of MS that has been several decades in the making and one that has overcome many hurdles. B cells are a type of immune cell that has been shown to play a key role in multiple sclerosis. They are the target of a new MS drug approved by the Food and Drug Administration. At the time, it was still widely accepted that another type of immune cell, known as T cells, were the culprits behind MS — an idea based on an inaccurate mouse model of the disease. In the mice, researchers could transmit an MS-like condition from one animal to another simply by transferring T cells, but the underlying tissue changes in the mice did not closely resemble those in human MS. Nevertheless, most researchers shrugged off the discrepancy and continued to rely on these models. When Hauser started his own laboratory at Harvard University in 1986, he set out to find a model of MS that had more fidelity to the human disease. This work continued after he moved to UCSF in 1992 to become professor and chair of the Department of Neurology. After many years of setbacks, Hauser in the mid-1990s, together with postdoctoral fellows Luca Massacesi and Claude Genain, developed a new animal model that replicated the behavioral and tissue changes seen in human MS.
T cells, another type of immune cell, were originally thought to be the culprit behind MS, thinking that was based on an inaccurate mouse model of the disease. The new model led to what Hauser calls their first eureka moment: when they saw antibodies tightly bound to the degenerating myelin proteins. These were the same antibodies that could be detected in the spinal fluid of patients with MS, and had long been used as a diagnostic marker for MS — yet considered to be insignificant to the disease mechanism because they were produced by B cells rather than T cells. Here they were, clearly complicit in the disease. In the new animal model, researchers found they could transmit the MS-like condition from one animal to another only if they transferred antibodies and B cells along with T cells. “This was a paradigm change for the field,” said Hauser. He and his team now believed that antibodies working alongside T cells were key to the myelin destruction. It would be another couple of years before they realized they still hadn’t hit the nail on the head. As a clinician-scientist, Hauser was eager to apply their laboratory discoveries toward a new therapy. He and colleagues wrote a grant to the NIH, proposing to test an existing cancer drug, rituximab, that targeted B cells and had been approved for B cell lymphoma. They hoped that in MS patients, the B-cell killing drug would stop the production of antibodies causing the inflammation. There was an almost immediate and nearly complete blockade of all new inflammation in the people who had received the drug. The NIH dismissed their proposal, suggesting they would be funded only if they switched to a T-cell therapy. In 2001, he approached Genentech, the maker of rituximab, and after 18 months of discussions and what everyone acknowledged were low chances of success, they began a preliminary trial that would allow them to test one dose of the drug. Because antibodies are not produced directly by B cells, but by long-living intermediate cells known as plasma cells that would not be directly targeted by the drug, Hauser and his team believed it would take several doses of the drug to eliminate the antibodies. “We were hoping that with one dose we would see a tiny little effect that would give us courage to embark on longer studies,” said Hauser. Instead, they saw an effect far more dramatic than they imagined. “There was an almost immediate and nearly complete blockade of all new inflammation in the people who had received the drug,” said Hauser. The stunning results after just one dose told them two things. “First that we had something that was likely to help many hundreds of thousands of people, and second that the science that had driven the experiments was wrong,” said Hauser. It was almost certainly not the antibodies instigating the nerve damage, a process that would’ve taken longer to reverse, but the B cells themselves. A few years later, Genentech, by then acquired by Roche, developed ocrelizumab, a newer B-cell targeting drug designed to be safer and easier to administer. That set the drug on the path for clinical studies and, ultimately, approval for patients. “My hope is that ocrelizumab will make a life-changing difference for many hundreds of thousands of people with MS today, and many more who may develop MS in the future,” said Hauser.